Golly gee, it’s been awhile since I updated this site. The last year has been a whirlwind and here it is almost a month into 2016 already. Whew! Well, let me catch my breath and catch you up on my life for the past 9 months. At the end of 2014 I officially left the Janiva Magness band. I toured and recorded with that wonderful group for four and a half years and thoroughly enjoyed my tenure with them, but it was time for a change. It might seem like a political cliché but I really did want to spend more time with my family, including my three young daughters, and less time on the road. And I missed my wife. So I said my goodbyes and began 2015 with a bit of uncertainty but a whole lot of pride as I released my first progressive rock album, THEO – The Game Of Ouroboros, to widespread acclaim. This was followed by Greg Nagy’s third album Stranded in March, which I produced, engineered, mixed, mastered, wrote songs for, performed on, and put a lot of sweat equity into. Both THEO and Stranded were included in Best of 2015 lists late last year. 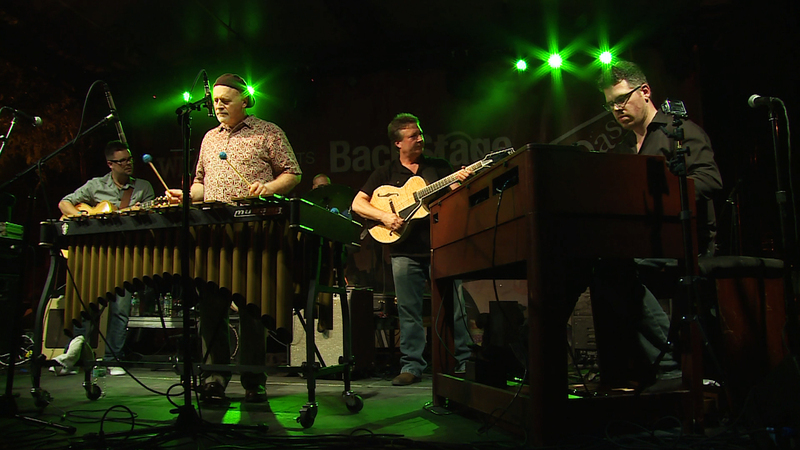 Stranded was named one of the best releases of 2015 by none other than Downbeat magazine. Both are currently up for WYCE Jammie Awards, which don’t really mean anything outside of Michigan but isn’t it nice to be recognized by your peers in your hometown? Since then I’ve been working on a follow-up to THEO and revitalizing my jazz trio organissimo. Our current guitarist Larry Barris has helped to breathe new life into the group and we’ve been writing new songs, playing fun gigs, and even doing some light touring on the East Coast. We’re also working on two new albums worth of material. The first is our interpretation of classic songs by The Beatles. The second is all original material. We made a quick teaser video for the project which you can watch below. We’re also working on collating several multi-track and video recordings of various gigs we did over the last few months for a live high-def video/audio package. In between that, I’ve been tuning and repairing pianos, doing my best to carry on my father’s legacy as a dependable and affordable piano tech in the Lansing area, playing with many other bands and musicians, mixing albums and EPs for other people (including trombonist Michael Dease and guitarist Randy Napoleon, both Professors of Jazz at Michigan State University), and touring and recording with Big Apple Blues. I’ve also contributed reviews to Keyboard Magazine and I’ve recently perfected the art of making omelets. Life is good! Thank you for your continued support via this page and my YouTube channel, the organissimo site including our extremely popular jazz discussion forum, hanging with me over on FB and The Keyboard Corner, and asking me about all things Hammond via all those channels and email. I’ll be more diligent in updating this site in 2016, I promise! THEO ‘The Game Of Ouroboros’ is my progressive rock release. I worked on the album for almost four years in between touring with the Janiva Magness band, playing numerous local gigs, tuning and repairing pianos, and releasing two other albums (organissimo’s Dedicated and Jim Alfredson’s Dirty Fingers – A Tribute To Big John Patton). I wanted to not only bring the keyboards back to the forefront in rock music but also strike a balance between classic vintage sounds and more modern textures. In this multi-part series, I will describe the different keyboards and synthesizers, both hardware and software, that I used on the album. You can read Part 1 here. It goes without saying that the original Minimoog is an iconic instrument and its legacy is well deserved. I always wanted a Minimoog but decided on the Voyager, Moog’s modern re-creation, due to the performance features including presets. As cool as the idea is in theory, I did not want to haul around two or more original Minimoogs just to have two different sounds available while playing live. I purchased my Signature Edition Voyager in the early spring of 2008. I bought it used from a fellow synthesizer enthusiast in St. Claire Shores, MI. 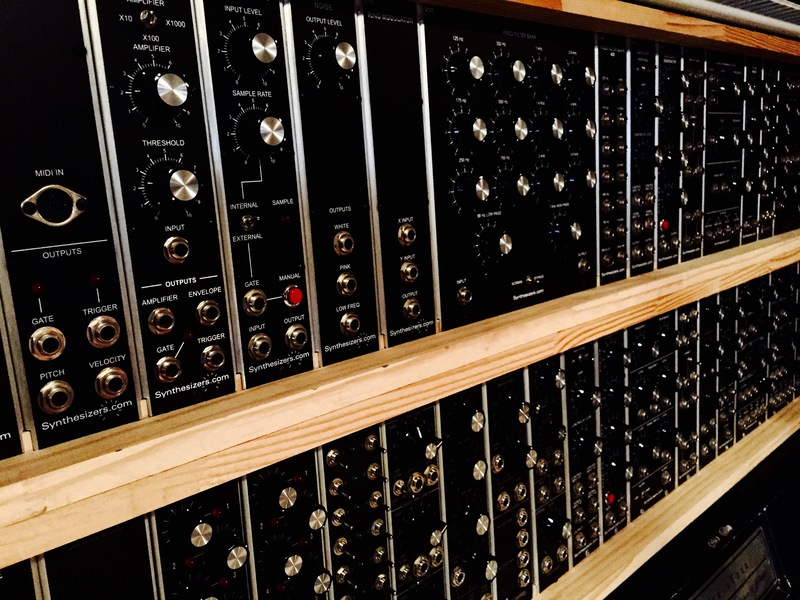 When I walked into his modest brick home that sunny yet chilly March day, I entered a living room filled with amazing analog synthesizers including an original Minimoog, two ARP 2600s, Korg PS series synths, a couple EMS VC3 synths, a Memorymoog, and more that I cannot even recall. To my surprise he had kids and a wife as well! He recorded everything onto 1″ tape and his music, which he graciously played for me, is best described as Berlin-style ambient electronica (Tangerine Dream). My rig for the making of the album “In Memorandom” circa 2009. 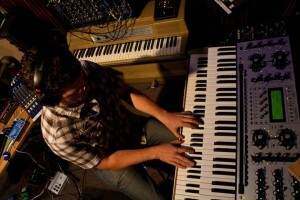 Moog Voyager on top of a Yamaha SY77 and SY99. The Voyager was my first analog synthesizer. I had grown up with digital synths including the venerable Yamaha DX7. I also briefly had an Ensoniq ESQ-1, a Casio CZ-1000 borrowed from a friend, and later my Yamaha SY77 which I still own and use. But I wanted a real analog for some time and the Voyager was my ideal. I was also in the process of recording organissimo’s third album, Groovadelphia, in my home studio. One particular track, If Not Now When?, needed something. I kept hearing a simple sinusoidal lead line, like Stevie Wonder would’ve played on the TONTO synthesizer, weaving in and out. I made a sound on my Motif ES rack and it worked fine enough but when I finally got the Voyager home and created the patch it sounded so much richer and fit in the mix so easily. I was hooked. 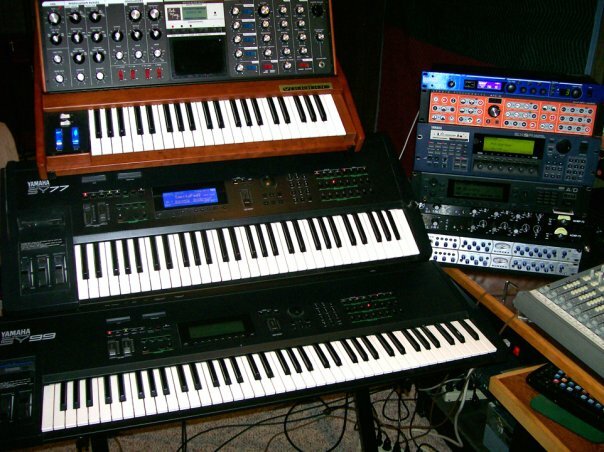 I made up my mind that I would get a true analog polysynth (see The Keyboards of THEO Part I – The Alesis Andromeda). I used the Voyager extensively on THEO – The Game of Ouroboros. Most of the lead synth lines are the Voyager, sometimes layered with Steinberg’s Retrologue just to add to the thickness of the sound. The ethereal chords at the beginning of The Blood That Floats My Throne are also the Voyager. I also used it for almost all the basslines during the writing and demo stage but those were replaced by Gary Davenport on Chapman stick or fretless bass. Funny enough, I also used the Voyager as my main MIDI controller as I was writing the songs on THEO, playing parts into Cubase. A lot of these parts would eventually be replaced by real instruments but a good portion of them stayed including the tracks of Camel Audio’s Alchemy VST. One of my favorite solos on the THEO album is from These Are The Simple Days, which is played on the Moog Voyager. It was also the first through-composed solo I wrote on the album, which was a real challenge for me. Improvising a solo is no problem with my jazz background, but actually writing a solo that will always be the same (like Tony Banks did with Genesis) was much more difficult. After weeks of failures, I finally set upon the idea of improvising several takes and then combining the best elements into a cohesive statement. I think it turned out well. The above is from the original demo recording with fake drums and no guitar yet added. You can hear the entire song from the complete CD in this video. The Moog Voyager is truly a beautiful synthesizer both aesthetically and musically. I have tried several times to replace it with other synths, mostly for live purposes (it is quite heavy and large to haul around) but nothing I’ve used so far sounds as good. It’s a joy to play and the variety of sounds is astonishing given the relative simplicity of it’s subtractive synthesis. I wanted to not only bring the keyboards back to the forefront in rock music but also strike a balance between classic vintage sounds and more modern textures. In this multi-part series, I will describe the different keyboards and synthesizers, both hardware and software, that I used on the album. 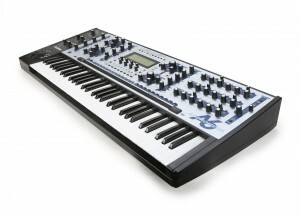 Let’s just get this out of the way: The Alesis Andromeda is a monster synthesizer. Released in 2000 and discontinued in 2010, the Andromeda is arguably the most powerful analog polysynth ever made. The specs are impressive: 16 voices, 2 oscillators per voice, 5 waveforms, 2 multi-mode filters, a powerful pattern sequencer, an arppegiator, a really cool ribbon controller, and knobs knobs knobs a-plenty. Yes, there are some weaknesses including the lack of promised poly-aftertouch and some bugs in the OS. It is also built with proprietary chips and parts are getting scarce. But the sound is incredible. It is capable of emulating a wide range of classic sounds including Minimoog style leads and basses, Oberheim pads and brass, Prophet-5 type sync leads, and even sounds reminiscent of the mighty CS80. The Andromeda enters fairly early on THEO. That thick, swirling string sound at the intro of the very first song (the title track) is the Andromeda through an Eventide SPACE reverb pedal and then filtered in Cubase. The Andromeda returns on the third track, Creatures of Our Comfort, in the form of the panning synth string pad and the more mellow pad. It also covers the deep synth bass at the very end. The string sound from the first song re-appears in the instrumental section of These Are The Simple Days and it’s the last sound you hear as the instrumental section transitions into the lyrical reprieve that ends the song. The Andromeda is all over the next track, Idle Worship, including the panning arppegiating lines and that fantastic brass swell that sounds like UK’s classic song Alaska. One of the coolest features of the Andromeda is the inclusion of 16 dedicated outputs, one for each voice, via eight 1/4″ TRS jacks on the back. On Idle Worship, I recorded the arppegiated lines by connecting all 16 mono outputs to a mixer, and then randomly assigning each of those 16 outputs to eight sub busses. I then recorded those eight sub busses into Cubase and panned them randomly around the 5.1 surround field so that each note of the arppegiated pattern appears at a different spot in space. The effect is pretty amazing, with notes in quick succession appearing in completely different places around your head. Even in stereo it sounds cool! Here is a test I did before the actual recording to hear how it sounds. On the final song, Exile, the Andromeda is generating that phased string sound that reminds me of the old ARP Solina string ensemble during the quiet middle section. Originally I had used a patch from u-he’s Zebra but decided to program the sound on the Andromeda instead and I’m glad I did. It fits into the mix so much better. I believe I ran the outputs of the Andromeda into a MoogerFooger Phase pedal. The Andromeda is also doing the arppegiated line during the epic end solo section. In the studio at Glenn Brown Productions for an Intergalactic Spiral session. Photo by Corrina Van Hamlin. The Andromeda is a desert island synth for me. I hope mine never succumbs to the issues that some users have experienced, issues that can render it useless. After Alesis folded and emerged from bankruptcy under new ownership, the Andromeda was never the same and some of the later models exhibit problems including failing proprietary components. Mine appears to be functioning at 100% so far and I hope it continues to do so for years to come. It is truly the King Of Analog Polysynths and rewards patience in programming with stunning sound. Before I purchased the Andromeda, I seriously considered buying an Oberheim Matrix 12 instead. 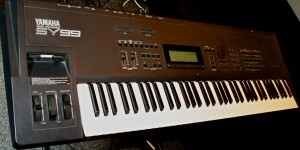 At the time, both synths were about the same price on the used market. Since that time, the Matrix 12 has almost doubled in price and Andromeda prices have stagnated. I always wondered if I made the right decision. A few months ago I finally got my hands on a Matrix 12 via a friend who amassed quite the vintage synth collection and while the sound was great, it didn’t blow me away. Then again, we were playing it through an mono tube amp with a small speaker. I came home confident that I made the right decision to buy the Andromeda. What an amazingly rich and lush sound. In the past few days, I’ve experienced doubt yet again whether I made the right choice. So I’ve spent some time really sitting down with the Andromeda and getting to know it better. And I’ve discovered some more strengths and weaknesses. Firstly, the UNISON X mode is incredible. By default, the Andromeda triggers two oscillators per note, each with five waveforms available simultaneously. By pressing the UNISON X button, you can make the Andromeda trigger four oscillators per note, or six, or eight, all the way up to all thirty-two (sixteen voices times two oscillators per voice). And you can detune them with one knob turn as well. This can make a thin and dull patch sound absolutely enormous instantly. Secondly, I learned that it’s really easy to overdrive the filters both pre and post, which can lead to wave shaping (ie, distortion). Turning down the feed of the oscillators into the filters creates a much smoother, more pure analog sound. But I also learned that the panning leaves a lot to be desired. One of the coolest features of the Oberheim is the ability to pan each voice anywhere in the stereo field, or do so randomly. This ability further increases the sense of largeness of the Oberheim. Although there are a vast number of modulation sources for the panning, none of them that I found achieves that random voice panning effect and they all seem to affect the entire output, not individual oscillators or voices (two oscillators each). The only way to really do this is to use the individual voice outputs connected to a 16 channel mixer and set the pans on the mixer wherever you’d like. This seems like a rather confusing oversight on the part of the OS design team. Despite this and with the help of the Andromeda Tips & Tricks article, I’m programming some really nice, deep, rich sounds from the Andromeda. My lust for the Matrix 12 is not gone yet, but it is abated somewhat. Next week in Pt II – The Moog Voyager. This will not be a post about how hard it is to be a musician in the digital age. We all know it isn’t a cakewalk. That said, I would rather be doing what I’m doing than work for someone else in a cubical somewhere making shareholders rich. I may not be a millionaire (or even a hundred-thousandaire… or even half that… I’ll stop now before I get depressed) but I am happy with my work. But it bears repeating as often as possible that when it comes to online streaming, which unfortunately appears to be the new form of distribution replacing physical sales, musicians are getting completely screwed. Just how screwed? 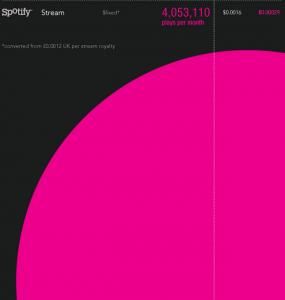 Back in 2010 the site Information Is Beautiful created a stunning infographic displaying how many streams an artist would need per month to generate enough income to be on par with a minimum wage job. And the results were horrifying. Yes, dear struggling independent musician operating in either a niche genre with less worldwide fans than your average hockey stadium capacity (ie, jazz) or (worse) in a popular field with millions of other competitors (ie rap, rock, pop): You are screwed. You need over 4 million streams per month to make a measly $1,160 which is probably not even enough to pay your rent and car insurance. Now Information is Beautiful has updated the stats for 2015 and the good news is that the rates have increased due to public and political pressure. It now takes about 1 million plays on Spotify to reach minimum wage. So that’s an improvement, right? Sure, but let’s be honest here: If you’re getting 1 million plays a month on Spotify you’re probably already a big name in the business. 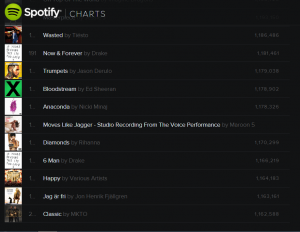 This begs the question: What artists are getting around 1 million streams per month? Thankfully this is answered very easily via Spotify’s own charts. As of this post, here are the artists that are getting about 1 million streams per month. Please note that many of these artists also appear higher in the chart for different songs. What’s the point of all this? Well, nothing you haven’t heard before. Streaming services are not direct income generators for most artists. This goes for Pandora, LastFM, Youtube, etc. But they are good means of distributing your product as a relative unknown. I have reached a lot of people via my YouTube channel and I make a few hundred bucks a month from it, which is nothing to sneeze at. And I’ve certainly gained new fans from Pandora and other services. I’m confident that some of those fans actually do buy physical product or at the least some downloads from iTunes and the like. But as streaming becomes even more pervasive and convenience continues to trump all else, I’m sure those sales will drop as well. So what’s the solution? I don’t really have one except to keep making music and perhaps put the focus on formats that are not yet streamable, like 5.1 surround. I’ve discovered a vital community of surround enthusiasts since releasing THEO. And they are hungry for more content which is why my next two releases (organissimo and another electronica / ambient project) will also have 5.1 versions. Vinyl is another viable option to spur actual physical sales. One day maybe I’ll be well-known enough that I can pull my catalog from Spotify ala Taylor Swift. But until that day, it’s best to focus on the strengths of the format rather than the pitiful payments. I’m honored that Keyboard Magazine asked me to review the new Roland JD-Xi synthesizer. The written review will appear in the upcoming May 2015 issue. Roland is marketing this mini-key synth as a “Crossover Synthesizer”. This double entendre refers to the combination of a two-part digital synth engine with a monophonic analog synth engine that’s reminiscent of the SH-101 and that the synth is supposed to appeal to both synth enthusiasts / keyboard players, and non-keyboard playing musicians / producers as well. Keyboard Magazine posted a video I made in my humble home studio detailing the main features of the instrument. The enthusiast site Synthtopia posted it as well and some of the comments are funny! Several people complained that the video didn’t go in depth enough (that’s because it is an overview, not a review). Other people claimed a vast conspiracy headed by Roland to dissuade any negative press. And about a half dozen people commented on my shoes and the “poor production quality” of the video. I’m now officially referring to this as Shoe-gate! To ‘clear the air’ about my funky footwear in the video; they are a pair of 15 year old New Balance sneakers that are my “bum around the house” shoes. I had forgotten I had them on when I recorded the video but other than the faux pas about the filter (which is obviously a 4-pole/24db filter and not a 24 pole filter; I simply misspoke) I thought the video did what Keyboard asked; that is, give a brief overview of the features. It is not intended as an in-depth review, which again is being printed in the May 2015 issue. 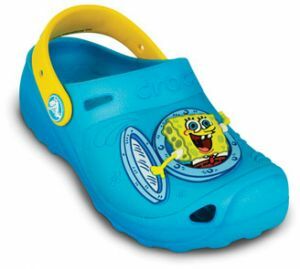 I’m thinking that quirky kicks will be my trademark from here on out! What will I wear next? Get ready, Synthtopia nerds! I’m coming for you! Here’s the video. Avert your eyes if you are offended by loathsome loafers!!! 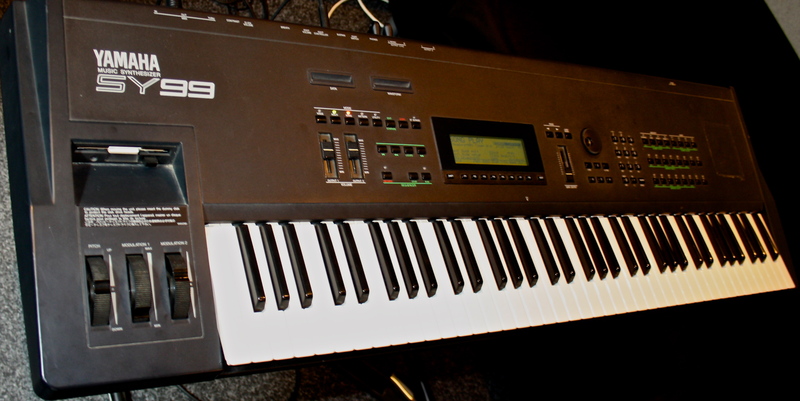 The Yamaha SY99 synthesizer was released in 1991 as the flagship of Yamaha’s line. Around that same time (maybe 1990?) my father and I drove to Detroit from the Lansing area with $2000 in cash to purchase a floor model of the SY99’s little brother, the SY77. Having sold his Yamaha DX7, Yamaha RX7 drum machine, an Ensoniq ESQ-1, a Fostex four-track cassette recorder, and some other goodies to fund the purchase, my dad and I were very excited to get the SY77. I loved that synth and used it every day for years and years. But I have to admit I always lusted after the SY99 because you could load your samples into it’s massive 512kb internal memory! Watch out! 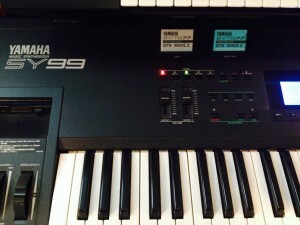 Yamaha SY99. Ironically, this jpeg is larger than the internal user sample memory available in the SY99. I still have the SY77 as briefly discussed in a previous post and since everything is cyclical, the digital synth behemoths of yesteryear are not worth all that much these days, with a few exceptions. Everybody has gone analog crazy! So a few years ago I found and purchased an SY99 for a ridiculously low price. I used it sparingly on In Memorandom and I’ve been slowly programming a bank of analog emulations using only the FM engine. Otherwise, it hasn’t seen much use. 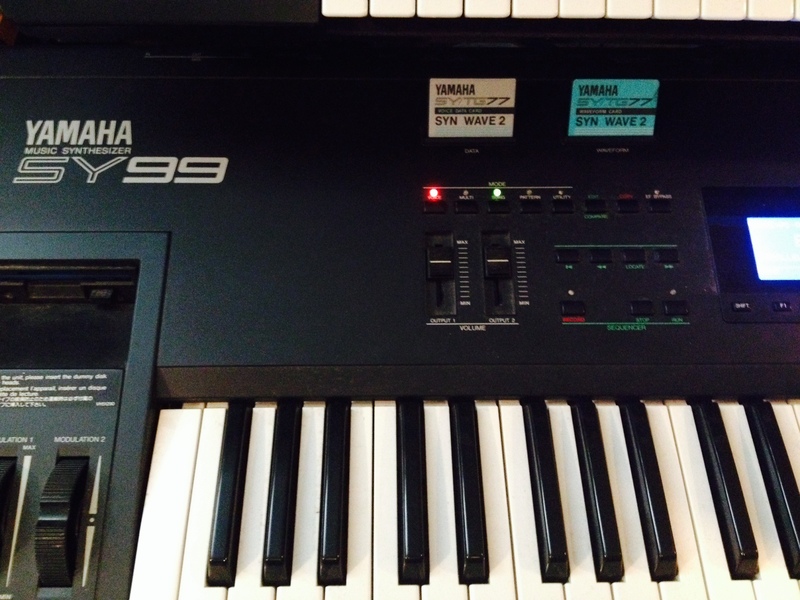 Yamaha SY99 with the SYN WAVE 2 voice and data cards. Lately I’ve been looking for some waveform cards. These are cards that Yamaha released to expand the available waveforms for the SY77 and they are compatible with the SY99 as well. I also recently discovered that someone is working on creating new waveform cards that can be loaded with your own samples! Amazing. That same person reverse engineered the RAM expansion cards, which are impossible to find, and offers the recreations for sale on his Sector 101 page. He also offers FLASH RAM for the Yamaha EX series, again reverse engineered. I like this guy! 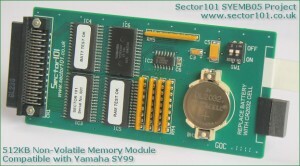 Sector 101 SYEMB05 RAM expansion module for the SY99. But back to the waveform cards: I’ve been searching for a particular set for a few years and finally found them for a decent price on eBay. The SYN WAVE 2 card contains sampled waveforms from the venerable Yamaha CS80 and has a companion card with patches created from these waves. So I decided to make a little demo of it! For the video, I connected my SY99 to the Eventide TimeFactor and SPACE pedals. The onboard effects in the SY99 are not the best, though they were quite good for the time. Some of the patches use a combination of onboard effects and the outboard pedals but most have the internal effects bypassed. All sounds are from the SY99 SYN WAVE 2 card set with the exception of the drums, which are from the Roland JD-Xi that I just finished reviewing for Keyboard Magazine (more on that neat little synth in a later post). The SY77 and SY99 are capable of some amazing sounds. The AFM (Advanced Frequency Modulation) engine is very powerful and flexible and they are the only synthesizers I know, software or hardware, that can use sample waveforms as operators in the FM synthesis engine. Plus they are built like tanks. My poor SY77 has survived six foot drops onto concrete and hundreds of gigs in its 25 years of service. So far I’ve only had to replace the floppy drive belt, LCD screen (which dim over time), and the small battery that powers the internal memory when turned off. I did the same to the SY99 when I received it. Up next is replacement of some of the push buttons on the SY77, which are beginning to fail after years and years of repeated use. 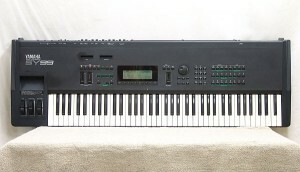 I would love to see Yamaha release another FM synthesizer coupled with the modern Motif AWM2 engine. But that will probably never happen in this age of inexpensive software synths. However, if the recent acquisition of Camel Audio by Apple proves anything, it’s that software is only as reliable as the support it receives from the company. I adore Camel Audio’s Alchemy and use it constantly. It’s on every track on THEO – The Game Of Ouroboros, usually multiple instances of it. And now the company is under Apple’s banner and most likely will not support PC users like myself anymore. So be it. But hardware survives even the death of the manufacturer. And with third party folks like the aforementioned Sector 101 guy supporting them as well, it looks like the SY series will be around a long time. Long live hardware! And long live the SY99! Early 90s digital synth sexiness! Lansing, MI – Jim Alfredson is best known for his work with acclaimed jazz trio organissimo and is considered among the best Hammond organists working today. His newest project is a solo album known under the name THEO that originated as a rediscovery of Alfredson’s affection towards the classic era of progressive rock. Inspired by classic bands like Yes, ELP, King Crimson, Pink Floyd, and Genesis, THEO brings epic songwriting and sweeping narratives back to the forefront with contemporary sensibilities and production. The album is scheduled for release on January 27, 2015 via Big O Records (USA) and Generation Prog Records (Europe). It is available as a download, as an audio CD, and as a limited edition CD / Blu-Ray set with 5. 1 surround mixes. Along with Jim on keyboards, THEO’s ‘The Game Of Ouroboros’ features Gary Davenport on bass, Kevin DePree on drums, and Jake Reichbart on guitar. The album, which is scheduled for release on January 27, 2015, took close to 3 years to complete due to Jim’s previous commitments and heavy touring schedule. Jim explains, “I began writing it in 2010. That’s the same year I joined the touring and recording band for the blues artist Janiva Magness who is based in Los Angeles. Between 2010 and 2014, I toured extensively with her and appeared on her last two albums. We toured all over the US and several times in Europe and Canada. It was a great experience but also left little time for family and for writing my own music. Somehow I managed to release two organissimo albums in that time and a solo jazz project called Jim Alfredson’s Dirty Fingers. Also during that time I recorded a lot of snippets of ideas on my iPhone while on the road during sound checks, in hotel rooms, and endlessly barreling down the highway to the next gig. When the touring season ended each year, usually at the end of October, I would collate these ideas and work on the best ones. We would start touringagain the following February, so I had only a few months to really work on things. 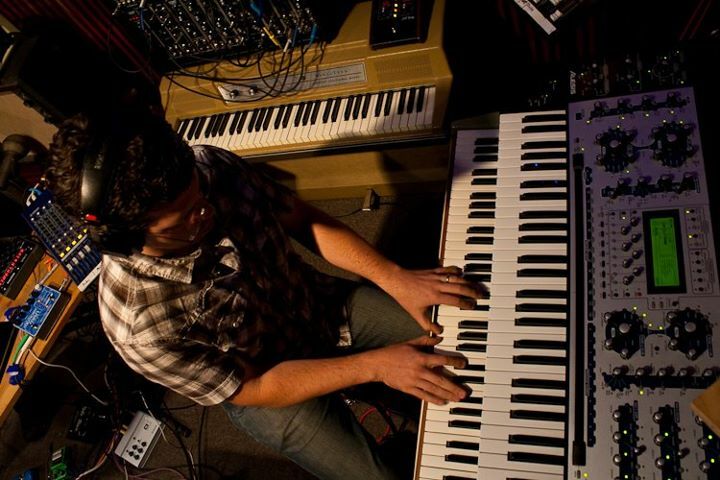 Although primarily known for his skill on the Hammond organ, Jim utilizes a wide range of textures on THEO. 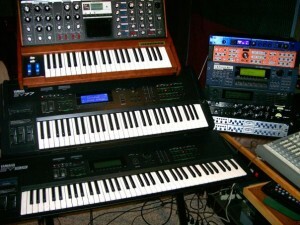 The rough and raw sound of analog synthesizers firmly connects the album to the halcyon era of progressive music while careful use of modern computer-based synths extends the music into the present. Acoustic piano underpins much of the album contrasted by swirling rhythmic elements easily at home in modern electronica. Gary Davenport’s deft work on the fretless bass significantly contributes to the album’s sonic appeal as does his mastery of the Chapman Stick on the first three tracks. Another noteworthy highlight is the real pipe organ on the track ‘The Blood That Floats My Throne’, skillfully recorded to capture the awe-inspiring majesty of the instrument. For 10 years, Jim served as organist and musical director of the highly successful, award-winning rhythm & blues band Root Doctor (1999 – 2009) producing three CDs for the band. 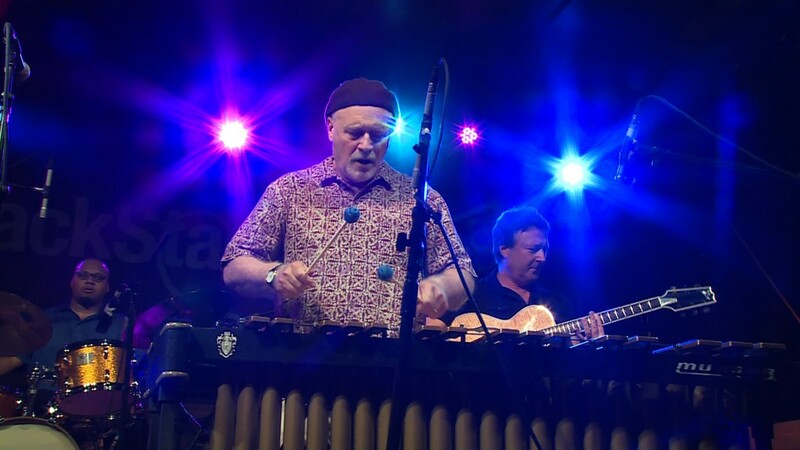 Jim formed the jazz trio organissimo in 2000. organissimo has released five critically acclaimed CDs and a DVD in the intervening years. In 2009 Jim released a very limited edition solo CD dedicated to the memory of his father called ‘In Memorandom’. Also in 2009, Jim engineered and produced Greg Nagy’s debut solo record ‘Walk That Fine Thin Line’ followed by Nagy’s ‘Fell Towards None’ and ‘Stranded’. 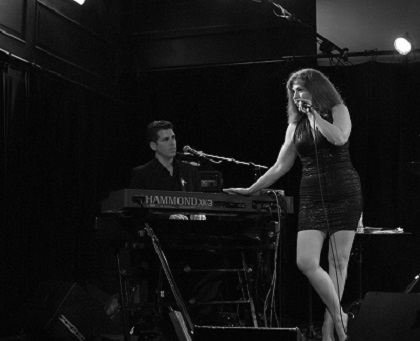 From 2010 to 2014, Jim served as the keyboardist and primary background vocalist in the touring band for blues singer Janiva Magness. He toured nationally and internationally with the band and is featured on Ms. Magness’ Alligator Records release ‘Stronger For It’ as well as her self-released album ‘Original’. In October 2013, Jim released another solo project entitled ‘Jim Alfredson’s Dirty Fingers’, a tribute to jazz organ great Big John Patton. “The Loudness Wars” is a phrase coined in the 1990s to describe the growing demand by labels for increasingly louder mastering. As the Compact Disc format gained prominence, engineers began pushing the limits of it’s upper dynamic range, squeezing every last bit out of it before hitting digital zero (and thus distorting). A loud master translated to a louder sounding song on the radio compared to the competition. And since our ears perceive louder as better (in general), the louder sounding your song was, the more people would buy it, right? Different releases of Michael Jackson’s song “Black or White” show increasing loudness over time: 1991–1995–2008. Thankfully after the 2008 fiasco involving Metallica’s Death Magnetic album, where the mastering was so loud as to actually digitally clip in most CD players, mastering engineers began fighting back. But considering the massive amounts of dynamic range available in modern digital systems, engineers still seem afraid of allowing music to breathe. Recording at 24bit yields a theoretical dynamic range of 144db, more than enough for any real-world application. An orchestra has a dynamic range of 70db, which is an incredible swing. I’m not advocating that kind of variation in other forms of music, but I’d wager that most pop right now has less than 3db of range across the entire album. Overall, it seems the most extreme examples of the Loudness War are in the past. That said, there are still records being released that seem afraid of the possibility that a listener out there might have to actually adjust his/her volume now and again. Why is this? Why is modern music production so scared of dynamics? I was listening to a new release on k-scope via progstreaming.com and while the music was very interesting, blending electronica and progressive music in a novel way, the lack of dynamics ruined the experience for me. Progressive music should have a lot of dynamics! 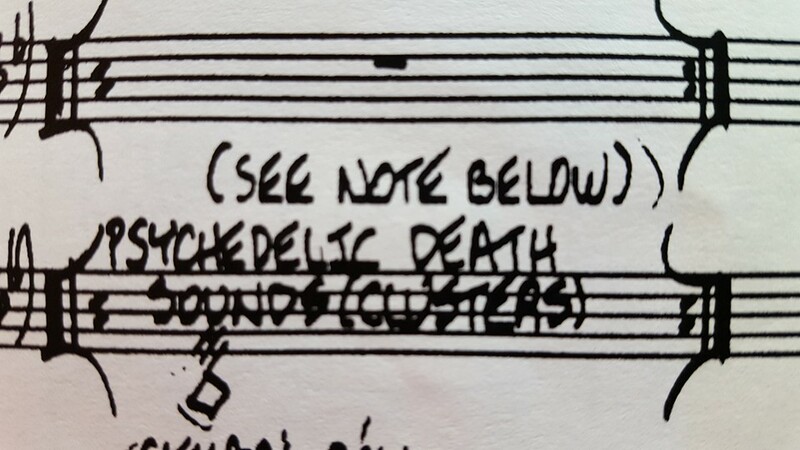 That’s one of the things that makes such music interesting beyond the odd time signatures and long song forms. The beginning of one song was especially egregious; it was obviously intended as a quieter part in the music, consisting of a lovely high falsetto lead vocal, piano, some atmospherics, and a bit of processed electronic drums. That all sounded great. Then the full band came in, acoustic drums channeling Bonzo, on a section that is (again obviously) supposed to be very powerful and the overall volume didn’t change at all! It stayed the same volume, sounding weak and neutered. We have more clean dynamic range than ever before. Even the best analog master tape only had a 14bit depth (in digital terms) and at best 80db of useable dynamic range and yet those old Yes, Genesis, and ELP albums have far more contrast between the soft and loud passages than their modern counterparts. Let’s not be afraid of dynamics. There’s nothing more powerful and simple than a rousing crescendo or a gentle decrescendo. Music without dynamics is like painting without texture. Or food that is decadently over sweetened. Sure, it tastes good for a little while but you quickly become fatigued and long for something with substance.